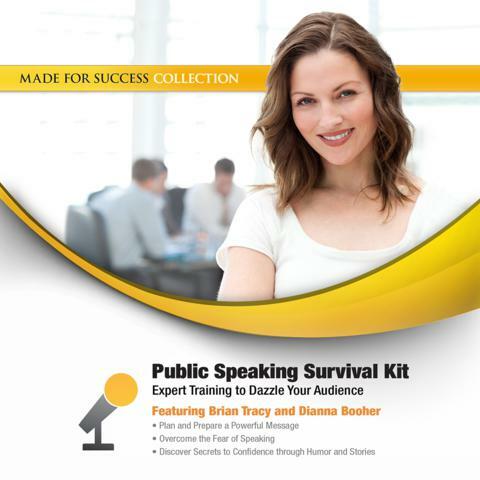 Effective public speaking starts here. Learn how to create and deliver a dazzling speech for any occasion. In this self-paced audio series, two of the world’s top communicators share the powerful techniques they have developed in their experience speaking to millions of people. In addition to the basics of public speaking, you’ll learn how to think on your feet, play off your audience, and banish anxiety and stress. Make your next speech a dynamic presentation full of energy and personality from the podium. Inspired by bestselling public speaking programs by Dale Carnegie, you will understand how legendary communicators like Winston Churchill, Ronald Reagan, and Bill Clinton can move the hearts and minds of an audience with humor, statistics, and stories. Develop confidence and charisma from the convenience of your car or while you work out with this powerful “must have” series. These techniques will guarantee that you will be competent and composed for your next presentation. DIANNA BOOHER’s extensive and ongoing research and published works in the field of business communication and productivity serve as the foundation for over forty books on communication skills training. She has received the highest awards in the professional speaking industry, including induction into the CPAE Speaker Hall of Fame®, and she is a member of the prestigious Speakers Roundtable. As a result of her work among top corporations on communication issues, Executive Excellence magazine has recognized her on its list of the Top 100 Thought Leaders in America. Additionally, Successful Meetings magazine named her on its list of the 21 Top Speakers for the 21st Century. She has been interviewed by Good Morning America, CNN, CNBC, USA Today, the Washington Post, Newsday, Los Angeles Times, Chicago Tribune, National Public Radio, Bloomberg, Investors Business Daily, Fox Family Network, Reader’s Digest, Cosmopolitan, Success, Entrepreneur, and many others. She holds a master’s degree in English from the University of Houston. DR. LARRY IVERSON For nearly thirty years Dr. Larry Iverson has educated, motivated and entertained audiences. From his work with Olympic and world-class athletes to the main platform of Fortune 500 conferences, Larry delivers persuasion and communication strategies you can apply right now. Larry blends vision with his background as a Clinical Psychologist in guiding you on an insightful journey, while you develop insights that assist your personal development. Larry masterfully uses enthusiasm and humor to help you gain control in your life.